Need a reason to explain away poor performance? Restoration Hardware CEO Gary Friedman has a million of them. 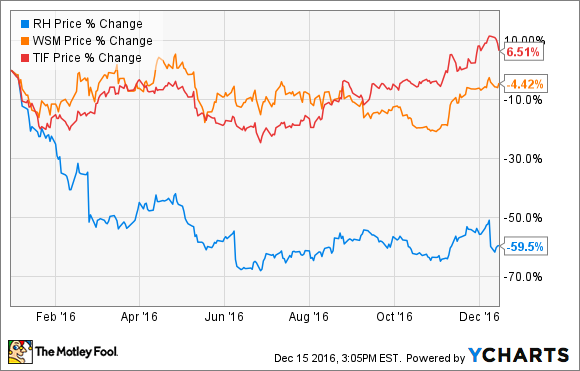 Not many companies have had a worse year than Restoration Hardware (NYSE:RH). The high-end home-furnishings retailer's stock is now down 60% this year, continuing a slide that began last November as investors worried about declining sales growth and a potential recession. As the stock has gotten pounded, Restoration Hardware's earnings reports have been filled with dubious excuses and self-inflicted errors. Retailers often offer up such glib explanations to cover up weak performance, citing things like the weather, the election, or any number of similar temporary factors that are outside the companies' control. While excuse-making among CEOs is something of an art as it's their job to instill confidence in the stock, Restoration Hardware CEO Gary Friedman has stretched the limits of credulity with many of his statements over the past year. Let's take a look at a few choice words from Friedman to see what they say about Restoration Hardware's future. The retailer's shares plummeted following its preliminary fourth-quarter earnings report in February as the company posted results that were well short of expectations for the key holiday period. Friedman blamed the underperformance on three factors. First, he noted shipping delays with vendors on the RH Modern line, but said they would be fixed by the end of the first half of the year. Second, its promotional activity, or discounting, was less effective that it had been in prior periods, "signaling a further pullback by the high-end consumer," which the company attributed in part to falling stock prices. Then came the kicker: "We continue to see underperformance in markets affected by energy, oil, or currency fluctuations -- specifically, Texas, Miami, and Canada -- representing a drag of 4 points to total Company revenues in the second half, which has weakened to a 5 point drag quarter to date in Q1." While the dollar has remained strong, perhaps deterring sales to Latin American customers at its Miami store, oil prices and stocks have bounced back since lows early this year. The Dow Jones Industrial Average has been ripping higher since Donald Trump's election, and could hit 20,000 any day, and oil prices have moved higher since hitting bottom in February. The recovery in those markets should dispel any notion that low oil or stock prices pressured RH's results. Notably, Friedman also followed up the report with an internal memo excoriating employees that they need a "MASSIVE CHANGE IN OUR CULTURE AND ATTITUDE NOW," as the all-CAPS leaked document said. That may have been the first sign the problems went beyond low oil prices. In its June report, the company said it continued to be challenged by headwinds in the energy and currency market and noted a slowdown in the luxury consumer market. 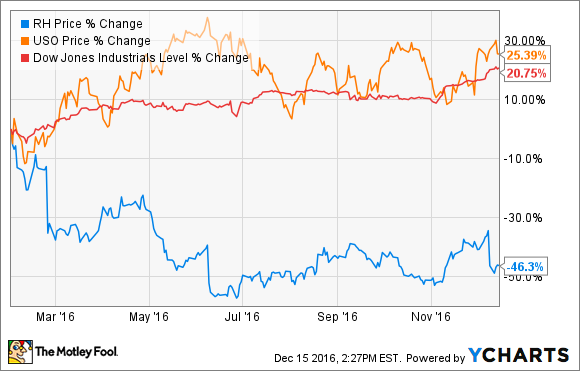 However, similar luxury stocks like Williams-Sonoma and Tiffany experienced no such pullback over the course of the year. Friedman also blamed continued delays at RH Modern and a change in revenue recognition timing as the company transitions from a promotional to a membership model. As a result, RH slashed its earnings guidance for the year. Finally, in its third-quarter earnings report, management blamed weak results on "consumer softness relating to the US election," and also noted delay on in mailing its Source Books, which is expected to weigh on holiday-period results. The election has been a popular foil among retailers through the fall. At least two other peers, Costco Wholesale and Pier 1 Imports (NYSE:PIR), reported earnings this month, and also noted that sales had been slow through the first two weeks of the November election. However, both companies said traffic bounced back strongly in the second half of the month, and Pier 1, which also competes in home-furnishings retail, even raised its fourth-quarter guidance as its performance has been especially strong lately. That bullishness is a sharp contrast from Restoration Hardware's position. Almost all of Restoration Hardware's attempts to blame results on the macroeconomic environment have been proven false. Its earnings per share is now set to fall by more than half this year from 2015, clearly justifying the similar slide in its stock price. Much of RH's mistakes seem to be simply poor execution: shipping and production delays, mailing out the Source Book late, and a shift to the membership model with the RH Grey Card, which is either underwhelming with customers, or management failed to warn investors ahead of time that it would cause a delay in revenue. Friedman has proven himself a retail wizard in the past, rescuing Restoration Hardware during the recession and redirecting it as a luxury brand, but his statements are becoming increasingly hard to believe. As the chairman of the board and, given his embodiment of the brand, it seems unlikely he'll be ousted anytime soon. However, almost any other CEO would be in the hot seat by now. It's a situation that's ripe for an activist investor. Oddly enough, the company seems perfectly poised to benefit from a Trump administration as a tax cut on the wealthy should spur increased spending at luxury consumer brands like Restoration Hardware, which would stand to benefit from a corporate tax cut as the retail sector has few loopholes it can take advantage of the way other sectors do. Whether Restoration Hardware's problems prove to be temporary remains to be seen as the company did not provide guidance for 2017. One thing is clear. Friedman's credibility has been severely damaged by this year's unforced errors and weak excuses.